a panel discussion with national sport leaders on the theme of inclusive leadership in sport. This event is for everyone—women and men, and those who identify. The experts agree: active leadership is key to bringing about equity for women. But what does inclusive leadership look like in 2017? Our panelists will share their lived experience as leaders in business and in sport, their perspectives on inclusive leadership “in real life” and strategies for advancing equity and inclusion for women through your leadership. It may be 2017, but the struggle to achieve gender equity in sport and physical activity continues. During this 1 hour webinar, Sydney Millar will reflect on persisting gaps and barriers that are slowing change, and share new opportunities and inspiring resources participants can use to kick start action to engage more girls and young women in their communities. For more information about this webinar, visit PARC's website. Offered in French by Guylaine Demers, this webinar is designed for coaches and administrators. It will provide you strategies to work with LGBT athletes and coaches to create a sporting environment that is safe and respectful for all. For more information about this webinar, visit CAAWS's website. Building on CAAWS’s popular publication “Actively Engaging Women and Girls: Addressing the Psycho-Social Factors”, this webinar, presented by Sydney Millar, will identify a number of key issues central to supporting girls and young women as athletes and leaders, including training environments, injury prevention, role models, and “on- and off-ramps”. Practical recommendations will be provided for coaches, recreation leaders, teachers, and sport administrators. For more information about this new webinar, visit CAAWS's website. If you were not able to join CAAWS’s “Leading the Way” webinars live, you can still catch them on our dedicated website for LGBT Inclusion. Experts Jennifer Birch-Jones (English) and Guylaine Demers (French) present tangible and effective guidance for program leaders and coaches who want to make their programs welcoming to all gender minorities. CAAWS’s Leading the Way: Working with LGBT Athletes and Coaches resource is also available for free download. Listen to the Webinars Today! Women and Girls, Ready to Get Moving? 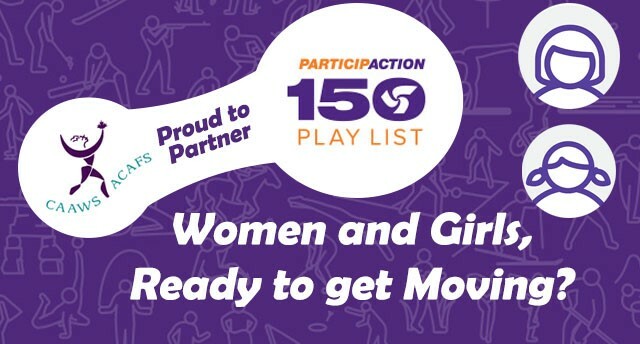 Given CAAWS’s passion for ensuring that girls and women can access and enjoy the benefits of physical activity, we are proud to partner with ParticipACTION for the #150Playlist. Research shows that women and girls in Canada are less physically active than boys and men. CAAWS wants change this and we are challenging you to try as many of the activities on the list as possible this year. Invite your friends and family to join! Don’t forget to share your adventures and photos on Twitter, Instagram, and Facebook. Make sure to tag @CAAWS and include #150PlayList! 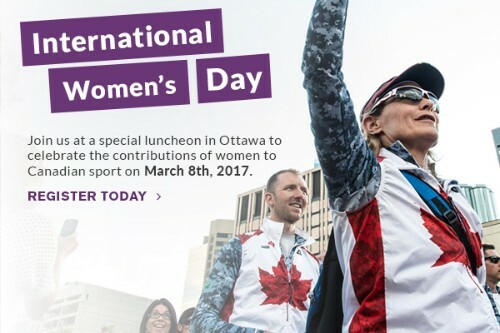 For more information on how to get started, visit ParticipACTION’s website. If you are an administrator or program leader, be sure to check out CAAWS’s handy tips and how-tos for creating inclusive and engaging sport and physical activity experiences for girls and women. Erica Wiebe, who was named Ottawa’s Female Athlete of the Year at the 2016 Ottawa Sports Awards banquet. Brianne Theisen-Eaton, Olympic heptathlete, who announced her retirement from Athletics. Athletes, Melissa Tancredi, Rhian Wilkinson, and Marie-Eve Nault who announced their retirement from the Canadian Women's Nation Soccer Team. Isabelle Charest, recently named Canada’s Chef de Mission for the PyeongChang Olympics.